A landlocked country with more thrills and spills than you can shake a stick at, Zimbabwe is every holiday makers dream. Despite its socio-economic woes, the country’s tourism industry is steadily gaining ground. Zimbabwe is opening up as a destination hot spot and wild life viewing mecca. With some of the best guides in Africa, it’s no wonder to see why people are slowing coming back. Discover species that are unique to Zimbabwe, or found in only limited ranges elsewhere, including the king cheetah in Gonarezhou, and the samango monkey in the Eastern Highlands. THE SMOKE THAT THUNDERS Discover one of the Seven Wonders of the World – the majestic Victoria Falls! The largest waterfall in the world, this natural landmark was deservedly declared a UNESCO World Heritage Site. SOUTHERN ZIMBABWE Enrich your African safari experience with a trip to Southern Zimbabwe. Be drawn to the magical allures of glorious scenery, astounding wildlife and the enigmatic remnant-kingdom of Great Zimbabwe, the largest historic man-made structure south of the pyramids. MANA POOLS NATIONAL PARK Immerse yourself in the scenic beauty of one of nature’s wildlife sanctuaries. Fantastic photographic opportunities and superbly romantic ambience for those dream hideaways. Choose this idyllic destination and enjoy canoe safaris, game drives plus a lot more exciting activities. LAKE KARIBA Treat yourself to a dreamy lakeside break on the shores of Lake Kariba. Take in the spectacular sunsets and spend your days fishing and viewing wildlife. Go there for the ultimate relaxation and adventure. HWANGE NATIONAL PARK The flagship of the wildlife parks in Zimbabwe, Hwange will delight you with its staggering game populations. The largest population of African wild dogs left in the world, large lion prides, buffalo herds plus brown and spotted hyena. The best place for leopard and cheetah sightings. CURRENCY The US Dollar (USD) is currently the main currency in Zimbabwe. Credit card facilities are few and far between with only the major international hotels in cities offering this facility. ATM’s are available in most towns and cities. CLIMATE The climate is tropical, although markedly moderated by altitude. There is a dry season, including a short cool season during the period May to September when the whole country has very little rain. The rainy season is typically a time of heavy rainfall from November to March. Temperatures can range from cold to very hot depending on the region and time of year. WHAT TO PACK If your safari is in winter, you’ll definitely need a warm fleece or jacket with gloves and beanies, especially in Hwange National Park. Day time temperatures pick up and shorts, t-shirts and light weight clothing is sufficient. Dining in the evening is a casual affair. Pack your swimming costume as most lodges now have a pool. Include sunscreen lotion, a cap and mosquito repellent. PEAK HOLIDAY SEASON The cooler winter months of May – October is generally the best time of the year to come on safari. Two nights Victoria Falls, three nights in Mana Pools and three nights in Hwange National Park. This is a quick glimpse into this dawning African destination for the safari goer who is looking at stepping off the beaten path. Experience old Africa charm in Victoria Falls at an iconic hotel. Then having an authentic African experience at two very remote fixed tented camps on a fully inclusive basis. A great tour and in depth exploration of this dawning African safari destination that is Zimbabwe. Start off in Bulawayo and combine Matobos, Hwange, Matusadona, Mana Pools and Victoria Falls. The opportunity to experience an arm chair safari at Kanga Camp in Mana Pools will no doubt rank as a highlight. Sit in comfort on the deck over looking the only water source on the concession. A waiter serves drinks as your guide talks about all the animals coming down to drink. A perfect combo safari for those who are pressed for time but maybe looking to add on to an existing holiday already booked. Spend 2 nights in Victoria Falls, enjoying the old African colonial charm of the Victoria Falls Hotel. From this famous World Heritage Site to the remote Linyanti region of northern Botswana, where you enjoy 3 nights in a beautiful fully inclusive tented camp. Professional guides, excellent dining and fascinating sight-seeing. This delightful tour starts out at the world famous natural wonder of the world, Victoria Falls. Soak up old African charm in the Victoria Falls hotel, then move on to northern Botswana to enjoy the fruits of the secluded Linyanti Bush Camp, a private concession with great views of the marsh. Complete your journey in style at the popular Khwai concession bordering Moremi Game Reserve. Appreciate authentic African experiences at these two fully inclusive tented camps. Join this incredible 10-night safari if you who want to maximise your game viewing experience by combining journeys into Botswana and Zimbabwe. This blitz tour offers thrilling scenery variations – from the wetlands of the delta to the arid regions of Hwange National Park, then back to the flowing rivers of the mighty Zambezi River. Explore the wonders of Moremi Game Reserve, Mana Pools, Hwange National Park and Victoria Falls – sensational wildlife and adrenalin rushing fun. Travel for 2 weeks into 2 wildlife-rich African countries where wilderness regions remain untouched and adventure beckons. The perfect Zimbabwe and Botswana safari combination for those wanting to see the main highlights of these two countries. Visit a total of 6 awesome regions in this super tour. Bring fishing equipment and see if you can catch Tiger Fish at 3 of the luxury camps listed. From Victoria Falls to Lake Kariba, Mana Pools, Linyanti and Moremi – wow! The life-giving power of the Zambezi River makes Mana Pools National Park one of Zimbabwe’s most lush and flourishing regions, designated as the country’s second World Heritage Site and known as one of the continent’s premier game-viewing regions. Canoe trips are offered year round and provide a unique and memorable way for visitors to experience the area’s striking scenic beauty and diverse fauna, while guided walks are a great way to take its pristine riverside forests. Spend 5 nights in the park at two camps with this fantastic fly in package. Combine adventure and dramatic wildlife encounters with this multi faceted safari in one of Zimbabwe’s most productive game viewing locations and the adventure capital of southern Africa. Enjoy exhilarating water sports and witness the might Victoria Falls. This packages is ideal for those looking for the ultimate safari but with little time on their hands. Explore the game-rich Zambezi National Park with rewarding wildlife encounters. Enjoy game drives and river safaris in Chobe followed by a relaxed tour of the mighty Victoria Falls. Take advantage of out of season rates with this safari package. A nation of spectacular natural beauty, friendly people and rich culture, Zimbabwe’s status as one of Africa’s leading safari destinations is growing. Hwange National Park is known for its huge herds of elephants; and a kayak trip down the Zambezi through the Mana Pools National Park will appeal to the intrepid traveler, providing close encounters with crocodiles, hippos and a host of other wildlife. Finish off at the spectacular Victoria Falls. An east to west exploration of Zimbabwe taking in Hwange, Matobos and Gonarezhou National Parks. With no flying involved, this road trip private tour is ideal for those who like to see more of the open countryside and explore areas off the beaten path. Highlights of this tour include Victoria Falls, elephants of Hwange, cave paintings at Matobo and the largely unexplored Gonarezhou National Park. See endangered African Wild Dogs in Hwange National Park, visit the Nata Bird Sanctuary. Enjoy mind-blowing game drives in the Moremi National Park & Khwai River area and cruise up deep channels in the incredible Okavango Delta. Game drives in Chobe, Victoria Falls splendour -these are just some of the sights you will see on the 15-day Botswana-Zimbabwe-Namibia safari. We offer comfortable accommodation with great perks, fantastic 4×4 vehicles and immersion in the wilderness. Luxury wilderness suites at the Elephant Camp offer private viewing decks with plunge pools, private lounge areas, air-conditioning & fans, complimentary mini bars and tea and coffee stations. Interact with the elephants at the Wild Horizons Wildlife Sanctuary. Then head to the Chobe River Front and enjoy world class game viewing from your private deck at the chic Ngoma Safari Lodge. Appreciate a few nights at the decadent Victoria Falls Safari Lodge, established high on a plateau which forms a natural boundary with the Zambezi National Park. Another elevated lodge is the luxury Ghoha Hills Savuti Lodge, sitting in the Ghoha Hills with breath-taking views over the huge Savute Channel within the Chobe National Park. 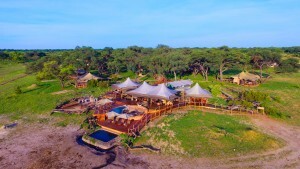 Later, discover Stanley’s Camp on a 260,000 acre private concession in the Okavango Delta, bordering the southern section of Moremi Game Reserve. Make sure you experience the tasteful facilities at “The Club”- private lounge and viewing deck overlooking the game corridor to the Zambezi River and a shuttle service to the Victoria Falls and town. Enjoy the wonderful Star Talk, led by a specialist guide, where you learn all about the galaxies. Your next 2 days at Chobe Game Lodge focus on excellent game drives and boat cruises, swims in the large swimming pool, exquisite food in the riverside boma area and plenty of exercise in the gym.